NYCC 2013: Whedon’s Buffy and Angel & Faith Return for Tenth Season! In Buffy, Season 10 is going to be about bringing friendships back together, while in Angel & Faith, relationships are shattered. Magic is starting to come back into the world, but in some surprising ways, like that vampire we saw standing in the sunlight at the end of Season 9. The Buffyverse community has been wonderfully welcoming to Rebekah and me. It’s a tremendous honor for Joss and Dark Horse to trust us with their flagship book, and we are going to do all we can to be worthy of that trust. It’s a new season, with new rules…but hopefully the same blend of love, action, horror, humor and creativity that’s made Buffy and her Scoobies part of all our families. We hope you’ll join us for the ride. I was proud and privileged to have a small part in season nine, and I can’t express how grateful I am to have an expanded role in season ten. Buffy the Vampire Slayer remains an iconic television show, and the Dark Horse comics continue that great tradition. I plan on having a lot of fun. Ryan Browne‘s God Hates Astronauts, coming this October from Image Comics, is outrageous, raunchy, absurd, violent, extremely popular, and everything you could want in a comic. NASA hires the Power Persons 5 to keep the nation’s farmers from launching themselves into space in homemade rocket ships. The bad news is that NASA is wasting their money, because this gang of hooligans is going to hang out, get drunk, have extra-marital affairs, and occasionally save the day in spite of themselves. NYCC 11 – Dark Horse Unveils Programming Schedule for New York Comic Con 2011! DARK HORSE UNVEILS PROGRAMMING SCHEDULE FOR NEW YORK COMIC CON 2011! SEPTEMBER 28, MILWAUKIE, OR—As anticipation grows for what has become the fastest-growing comic show in the country, Dark Horse gives fans the first taste of what to expect at this year’s New York Comic Con! Join Dark Horse’s senior managing editor, Scott Allie, and director of public relations, Jeremy Atkins, for a look at all that the publisher has on tap for the coming year. 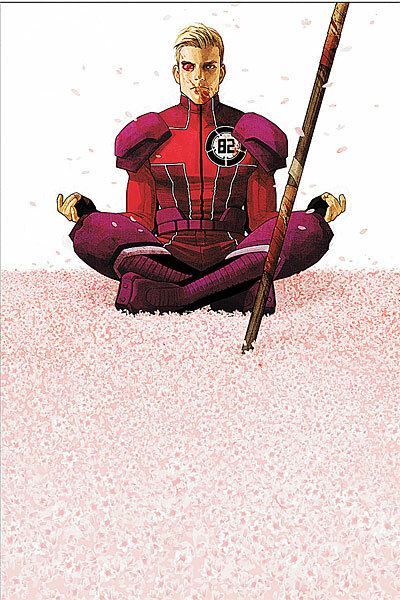 In addition to news about all of the hot new fall titles, like Orchid, The Strain, and House of Night, we look to 2012 for a sneak peek at what fans can expect in not only the company’s flagship anthology Dark Horse Presents, but also Star Wars, Avatar: The Last Airbender, and more! Guests include Tom Morello (Rage Against the Machine, Orchid), Brian Wood (DMZ, Northlanders, The Massive), Carla Speed McNeil (Finder), Rick Remender (Fear Agent, Uncanny X-Force, The Punisher), Jerome Opeña (Fear Agent, The Punisher), Tony Moore (Fear Agent, The Walking Dead), and more! BUFFY AND ANGEL PRESENT: DARK HORSE DOES VAMPIRES RIGHT! Dark Horse Comics invites you to attend a special panel highlighting the growing number of comics featuring vampires! In addition to the highly successful Buffy the Vampire Slayer comics, we introduce you to other titles, like Mike Mignola and Christopher Golden’s Baltimore, P. C. and Kristin Cast’s House of Night, and Guillermo del Toro and Chuck Hogan’s The Strain! Join Dark Horse’s managing editor, Scott Allie, director of public relations, Jeremy Atkins, and Angel & Faith’s writer Christos Gage and artist Rebekah Isaacs, as well as a few surprise guests, for a panel you can really sink your teeth into. If that’s not enough, every attendee will receive a free copy of Angel & Faith #1! With comics, novels, movies, and a third game on the horizon, Mass Effect has become one of the largest science-fiction franchises in the world. Join Mass Effect lead writer Mac Walters, along with Dark Horse’s director of public relations, Jeremy Atkins, and director of custom programs, Nick McWhorter, for an exploration of what makes Mass Effect so special! Fans will get a firsthand look at the upcoming comics series Invasion and the art book The Art of the Mass Effect Universe, as well as a taste of Mass Effect 3! With announcements to be made, surprise guests, prizes, and giveaways, we couldn’t give you more reasons to attend! With Hellboy dead, and the B.P.R.D. and the world at large in shambles, what’s next for this elite team of paranormal investigators? Enter the mind of creator Mike Mignola for a spirited discussion of the future of Hellboy, the B.P.R.D., Lobster Johnson, Edward Grey, and a world that has spawned television, novels, video games, and more. Attendees will be rewarded with exclusive insight, announcements, and even a special giveaway! Discuss the new Dark Horse Creepy series, the classic age of the Warren Creepy and Eerie magazines, and all the exciting things coming up in the Creepy universe with a bone-chilling panel including Louise Simonson, Joe Harris (“The Curse” from Creepy #1–#3), and a number of other special guests. Moderated by New Comic Company’s twin engines Dan Braun (Creepy) and Josh Braun (A History of Violence). Plus, there will be Creepy trivia questions with swag and prizes! Watch the Dark Horse blog for further announcements on signings, in-booth events, green-screen photo ops, and so much more! C2e2 is over and Sunday brought some news from Marvel. We got a look of some of the new creative teams and some new series. Below is a wrap up of the latest news as well as our special C2e2 section. Kotaku – Sunday Comics – Waste some of your Monday morning checking out some web comics. Rabble – Women at the forefront of the graphic novel revolution! – You go girl. Bleeding Cool – Joseph Gordon-Levitt’s Dark Knight Rises Role Revealed – Well this is interesting. Comicvine – WWTCC: More cosplay photos! – These get me want to head to Toronto Fan Expo even more. In honor of the Star-Spangled Avenger’s 70th anniversary, Marvel is pleased to present your first look at Captain America and Crossbones #1, from the creative team of writer William Harmes and artist Declan Shalvey! Fascist ideologue. Unrepentant assassin. Only hope? When a top secret experiment goes awry, Steve Rogers is forced to send his mortal enemy (and current Thunderbolt detainee) into quell the spread of a runaway virus. But, when he’s running solo, is Crossbones willing play the part of expendable asset? Or will he make sure that a black flag flies for the original super-soldier once and for all? Find out this March, only in Captain America and Crossbones #1! Marvel is pleased to present your first look at Captain America and Falcon #1, from fan favorite creators Rob Williams and Rebekah A. Isaacs! Kicking off a series of five one-shots celebrating the 70 years of the Sentinel of Liberty, Captain America’s erstwhile partner Sam Wilson, must confront his past to save a boy’s future! Join Captain America and Falcon as they take on an evil far below the spires of Avengers Tower – the very streets Falcon fought to escape. When Captain America and Falcon #1 hits stands this March, fans should rush out to their comic shops to be amongst the first to grab an exclusive print featuring the connecting covers of red-hot artist Greg Tocchini! Salute the legacy of America’s super-soldier all month long as Marvel pays tribute to Captain America and those around him who have made him the man he is! *Retailers should check the Marvel Mailer for special incentives on the below listed titles for great deals and promotions. Celebrate Captain America’s 70th Anniversary This March! This March, Marvel celebrates the historic 70th anniversary of an American icon, Captain America! Celebrate this milestone for the Sentinel of Liberty all month long with top-notch stories from Marvel’s top creators! Kicking off the anniversary month is Captain America And Falcon #1, the first of five great one-shots starring Captain America and featuring Falcon, Crossbones, the Secret Avengers, Peggy Carter and Batroc! Not only will each of these pivotal stories feature Captain America and those who have made him the man he is today, but they’re loaded with excellent bonus content! Fans also can’t miss out on the limited edition print of all of these five one-shot covers connecting by red-hot artist Greg Tocchini. Then, for fans who aren’t up to speed on Ed Brubaker’s critically acclaimed epic run on Captain America, find out where the future of Captain America is headed in a special Marvel Point One issue – Captain America #615.1 – great for new readers! Steve Rogers makes a decision on who will be the new Captain America that no fan can miss! Once you’re all caught up, you’ll be all ready for the supersized anniversary issue, Captain America #616, from the megastar creative team of Ed Brubaker, Howard Chaykin, Butch Guice and so many more! And that’s not all because all month long because no Captain America fan can miss out on special 70th Anniversary Variants featuring Captain America throughout the ages alongside Marvel’s greatest heroes by some of Marvel’s top artists! For 70 years, Captain America has fought for truth, justice and the American Way, and Marvel can think of no better way to pay homage to this iconic hero! Written by ED BRUBAKER, HOWARD CHAYKIN, MIKE BENSON, FRANK TIERI, KYLE HIGGINS, ALEC SIEGEL & MORE! Penciled by MUTCH GUICE, HOWARD CHAYKIN, PAUL GRIST & MORE! 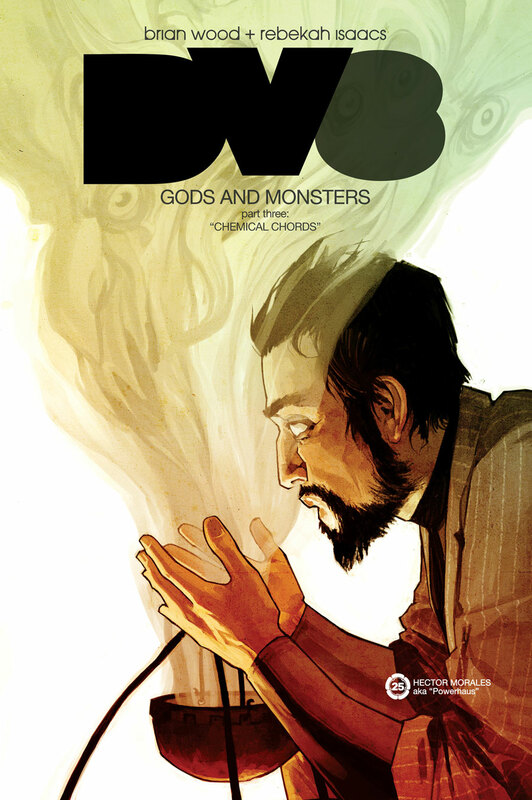 Another issue of DV8: Gods and Monsters and I feel like I’m running out of praise. Brian Wood is an amazing writer (I’ve struggled to find something of his I didn’t like) and the art Rebekah Isaacs seems to get stronger with each issue. We’ve given glowing recommendation for the first three issues, and this one is no exception. We’re introduced to another member of a team, this one embodying the god of war. But what happens when a person of infinite power meets a people who’s not scared of him? That’s the question proposed in this issue, and we see how Matthew Callahan earns the leadership of his tribe. Also, when all you’re trained for is destruction and war, what would you do on a new world? Each issue has taken a look at a member of a team and how they’ve adapted to their new lives on an alien world. Some have taken to lording of the people while others only seek peace. Overall an amazing series and we’re only at the half way point. Here’s to four more amazing issues. A definite buy! One of the best things about writing for a comics blog is getting to discover new comic books that you wouldn’t normally think of picking up at the store. Case in point is DV8: Gods and Monsters, whose third issue is released this week. If you’re a regular to this site, you’ll know we love this series and gave the first and second issues glowing reviews and the third is no exception. Brian Wood is beyond a talent and deserves more mainstream recognition. I struggle to think of one series he’s written that fails to impress. The third issue is a long debate about the rights of people to interfere in the lives of others. Also, the idea of technology is debated and the acceptance of how things work and if that in itself is a form of magic. That’s all wrapped around our introduction to Hector Morales aka Powerhaus who can take emotions and use it to grow. Rebekah Isaacs continues to provide solid art that enhances the story telling and adds to Woods’s story. Even if you didn’t pick up the first two issues (and you should), you’re doing yourself a disservice in not picking up this third issue. Even as a single story the debate alone about one’s right to interfere in others lives is worth the read. It’s subject matter is one that’s pertinent today and will make you think, exactly as a comic should. Check out below for the extended review and rating.